Tony and Justine returned from a very energetic boxing session – which was to give rise to much anguish later in the weekend – ready for a shopping expedition that took in the local wholesale butchers, the supermarket, the dressing up shop (for a grass skirt and lei for the evening’s Hawaiin dinner party) and to see the local Australian pie shop – a ‘full on’ couple of hours! After one of Tony’s splendid bacon and egg brunches, we were off to do some beachy sightseeing! First there was a coffee stop at a beach where Tony has finished one of his ocean swims in the past. From what I can make out these are 10 kilometre swims in what can be a pretty rough ocean. We were told a tale of a freak storm – Tony’s delayed return, Justine, Mickey and Coco escaping thunder and lightening and the rain (collecting a lost child on the way), running from the beach and sheltering in an open garage and Tony eventually managing to get through the surf, a very relieved mother and child reunited …… All told as a normal day out! Life in Australia sounds a bit too exciting to me sometimes! Looking back from the top we could see, not only the ocean and the beach, but a strip of land and the lagoon behind it – a frequent phenomena along this coast. 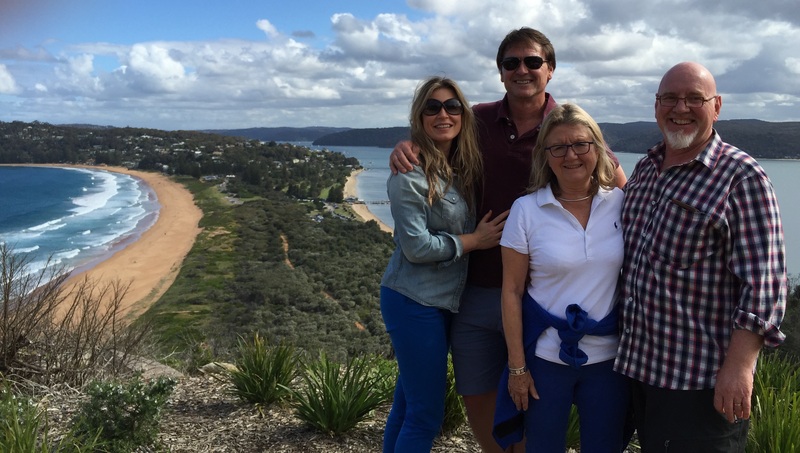 We took the opportunity while there to book ourselves onto a seaplane flight from the lagoon (weather permitting) for our last day in Australia on the 1st October……. Yet another adventure on this adventure of adventures. 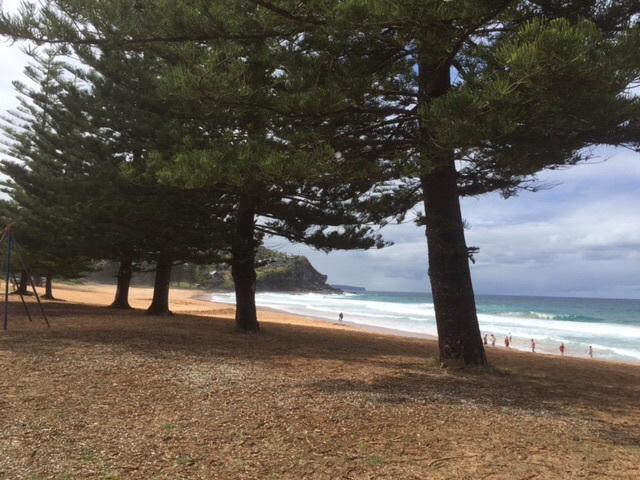 The area of Palm Beach has a very Australian feel – very outdoors, fresh, action packed. 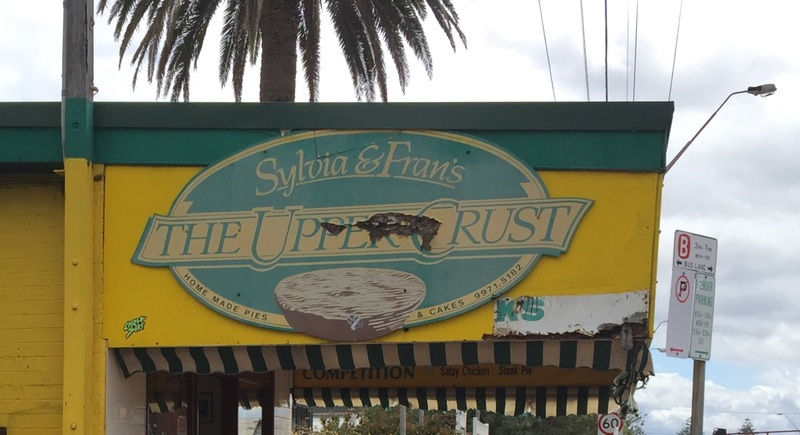 A quick stop for a snack at Barranjoey (where do they get these place names? ), it was back home to prepare for our dinner party with David and Lesley, the two good friends of Tony and Justine we had met at the Colleroy Club. In preparation Tony and Keith had lashed out on two highly suspect Hawaiin shirts especially for the occasion….. I have to report Keith somewhat reluctant to don this pineapple covered creation – I think it was the yellow that caused the reticence! I have never thought of yellow and Keith in the same sentence! 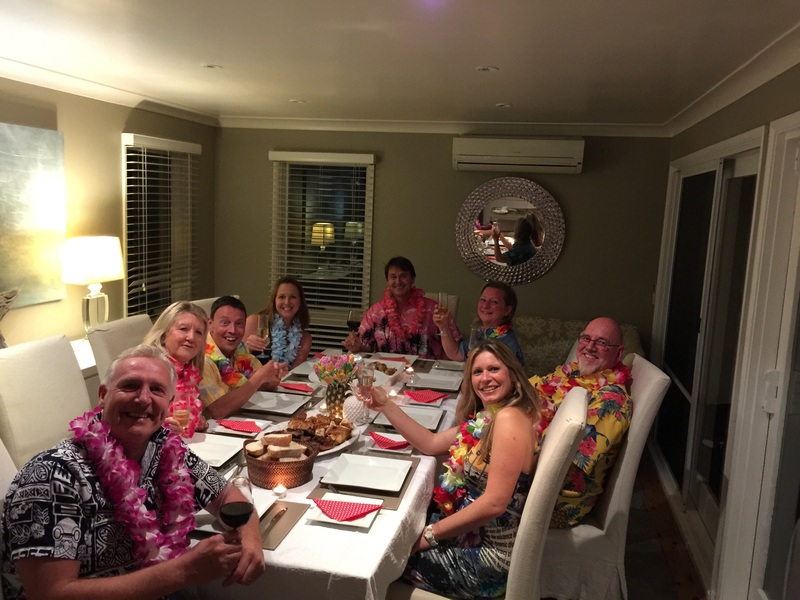 It was a great evening – Lesley and David (in his sarong!) were great hosts and we met two more English people who have moved to Australia to work, Wendy and Simon. They were lovely too and it was a very colourful and fun time, although for Lesley slightly dampened by the rain downpour that extinguished the flaming torches that she had strategically placed on the balcony! I was personally concerned that the light from these might cause a distraction for shipping or aircraft in the area as the Hallidays live on another high spot (Elanora Heights) across the valley from the Collaroy Plateau and, if anything, is even higher! The house is almost ‘perched’ on a rock shelf – we don’t cease to be amazed by the locations of these beautiful houses…..